We are celebrating after picking up two awards at the Chartered Institute of Housing’s annual Scottish awards in Edinburgh on 2 November. 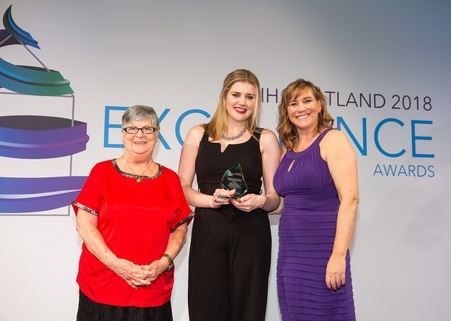 Housing Services Assistant, Rhona Matthew, 24, from Holm, Inverness, was named Young Achiever of the Year, with judges commending her for her ambition to succeed and her contribution towards supporting tenants with a range of issues including the transition to Universal Credit and dealing with antisocial behaviour. We also secured the Housing Team of the Year award for our work to reduce the number of days vacated properties remain without tenants. By improving their pprocesses and setting a target of ‘zero days’, the team has taken the average void period from 23 days to an average of just over nine in just six months. In fact, over the space of the year, almost 40 per cent of vacant properties were re-allocated the same day during the 2017/18 financial year. Speaking of the team’s success, Calum Macaulay, our Chief Executive, said: “Over recent years, the pressure on the housing sector to maintain the highest standards of excellence in a climate of welfare reform change, budget cuts and economic uncertainty has been enormous. However, this has helped us focus our minds on being more innovative and customer-centric. The Chartered Institute of Housing is the independent voice for housing and the home of professional standards. Now in their eleventh year, the body’s annual Scottish awards aim to celebrate the passion and commitment of the sector’s unsung heroes as well as exemplary housing projects, best practice and innovative ways of working.